Eureka Araujo has done Hotel Management from IHM, Goa. After that, she started her career with Taj Group of Hotels as Management Trainee in 2012. 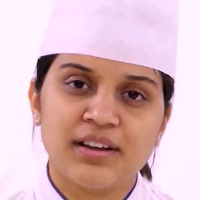 Later, she worked with Umaid Bhawan as Junior Sous Chef till 2014. She is working as Pastry Chef Instructor with Academy of Pastry Arts, Gurugram. A pastry chef is someone who is schooled and skilled in the making of pastries, desserts, bread and other baked goods. Some pastry items may include cakes, cookies, cupcakes, pies, tortes and ice cream. Pastry chefs are employed in large hotels, bistros, restaurants, bakeries, and some cafes. "After completing Hotel Management course, I Started my career with Taj Group of Hotels as Management Trainee in 2012. Later, I worked with Umaid Bhawan as Junior Sous Chef till 2016. I am working with Academy of Pastry Arts as Pastry Chef Instructor."